could any body tell what is involved in replacing the fan speed switch? It will only work on flat out, I have replaced the resistor but that did not make any difference. Are you sure it's the switch that's faulty? It just seems odd that all the low speed positions have failed yet the high speed position (which carries the most current) still works. If you have access to the resistor it's easy to check the switch from there by simply connecting a 12V bulb across the resistor connector terminals to make sure the bulb lights in each switch position. I can give you more detailed instructions if you want to give that a go. yes please. but as i have said ,I have replaced the resistor and it made no difference ,also i failed to say that the blower does work on pos.3 as well as 4 but not on 1 and 2. 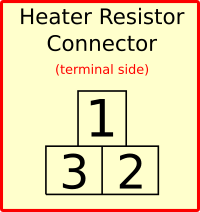 Disconnect the resistor, switch the ignition on then connect the bulb to the resistor connector as shown below. The first test checks that the blower motor power supply. The bulb should illuminate when the switch is in positions 1, 2, 3, and should be off in positions 0 & 4. The three tests that follow check the ground side of the circuit that comes via the blower switch. whilst playing around with it I noticed all speeds working if I pushed the switch in firmly. Auto heater controls use an electronic speed controller rather than a resistor but you test it in a similar way, although you need a voltmeter to test the speed control signal that is output by the AC control module. 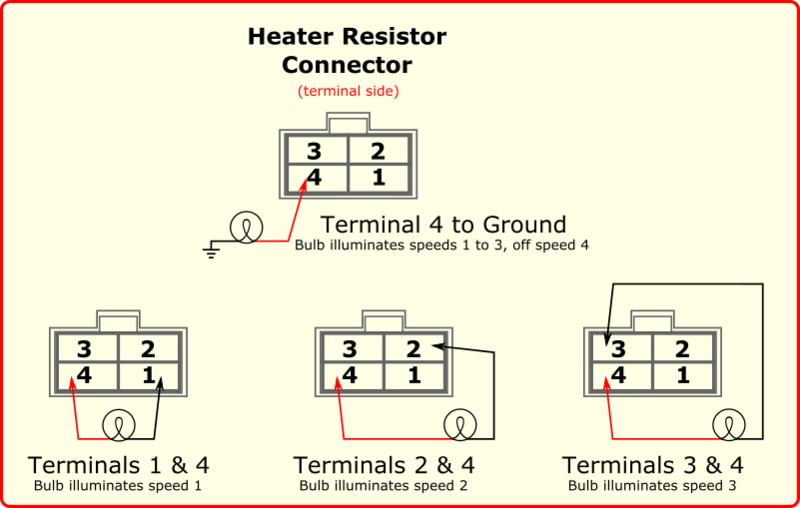 Disconnect the speed controller, then with the ignition turned on connect the bulb between terminals 1 & 2 of the controller's harness connector....see below. The bulb should light if both the blower motor power supply and the speed controller ground are OK. Yes, I think that's a safe assumption. Yes, the motor is running at full speed at position 4, so the resistor is completely bypassed and a direct ground is applied to the motor. Last edited by AUTOSPARK; 03-09-2019 at 09:48 AM.